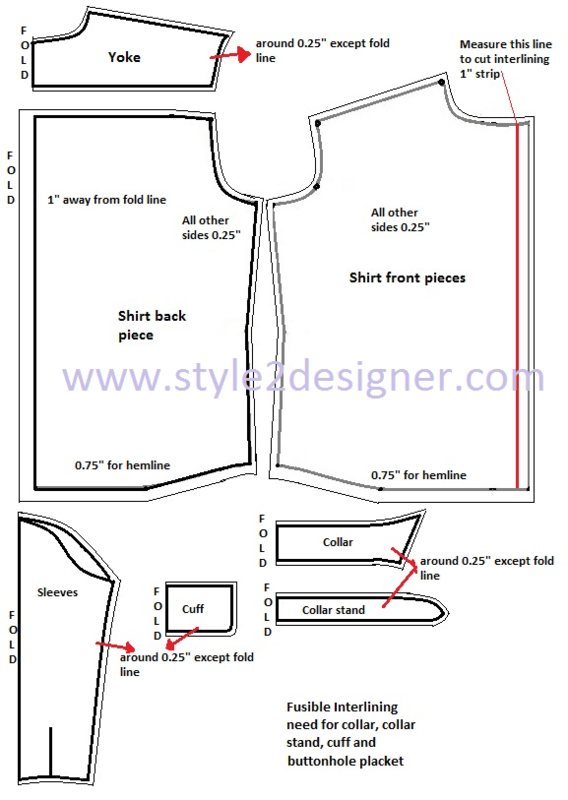 We are already know the drafting details of shirt front, back and yoke pieces (If you want to go through our previous tutorial (CLICK HERE). 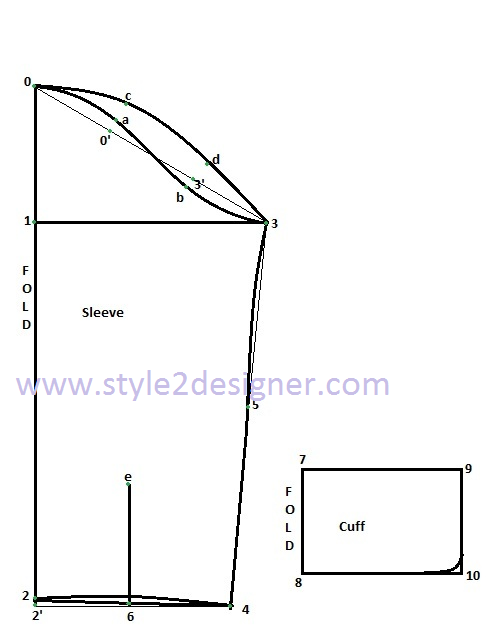 Now we are going to see here shirt sleeve-cuff-collar drafting and cutting details of the fabric with the help of drafts and sewing instructions. Connect 0-3 and divide that line into 3 equal parts then mark that as 0’ & 3’ as shown in draft picture. 5 is midpoint of 3-4. Join 5-3 with inside curve line. Join 4-2 ¼” inside curve for sleeve’s front side only. 6 is midpoint of 4’-2 and make 6” cuff opening for sleeve’s front side only. Give curved edge in 10. 7 is marked 1½” away from 2 and 2’ ¼” above from 2. You can use this same draft for single piece collar also, but here we are going to do this as two piece collar i.e., Collar and collar stand. 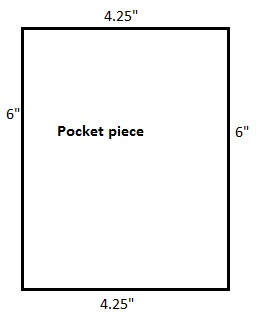 Need a simple rectangular piece of 4 ¼” x 6” (this includes seam allowance). Now we are going to cut our fabric with the help of drafts. First thing we have to press our fabric so that draft lays there perfectly without any wrinkle. I think it’s one of the most important steps. First place fabric fold in half with selvages together without any shrink. Above image is only for your reference about seam allowances for each draft pieces, which is not for draft placing instruction. You can place wherever, but remember the fold lines. Place draft perfectly and secured with pin or weight then mark on fabric with your fabric marker. Make sure about seam allowances all around mentioned in draft details image. Place Shirt’s back piece fold line 1” away from fabric fold line for Back pleats (refer image) and mark. All drafts are marked now. So remove drafts from fabric. Again secure the fabric with pin or weight for cutting purpose. Cut the marked fabric. We’ll also need to cut our interlining for collar, collar stand, and cuff and buttonhole placket. 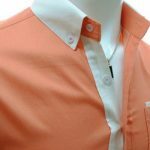 For button stand and pocket mouth interlinings are optional. 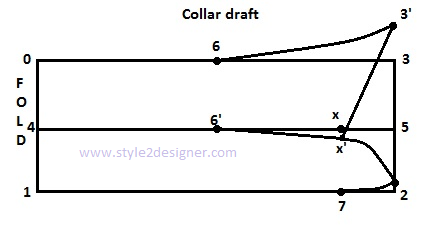 We are going to cut interlining for Collar, Collar stand and cuff by using draft. For buttonhole placket need 1” strip interlining is enough. Can you explain the Sleeve pattern a little bit more please? I can’t understand the armhole part, why the front armhole and back armhole are different? How should we cut the fabric then? Really appreciate for your tutorials! Looking forward for your answer! Thank you so much! What is the Cutting line of the sleeve?